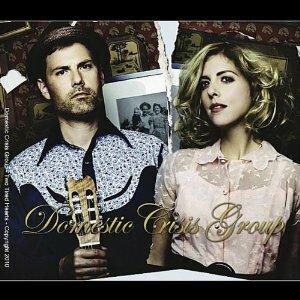 Classically-trained guitarist Dane Ratliff and Genevieve Blouin make up the twosome behind Montreal’s Domestic Crisis Group. Already praised by James Blunt, the pair have written more than an album’s worth of material in less than a year and will be playing the Canadian Music Fest in 2011. Blouin herself has worked with ’90s guitar-god James Iha (formerly of Smashing Pumpkins, A Perfect Circle) and record producer Gordon Raphael (The Strokes). Their 5-song EP Two Tired Hearts is an RV tramp through America, circa the not-so-distant economic crisis of 2009. “Put All Your Troubles Away” is the key track â€” it’s more cheerful than finding the prize in a Cracker Jack box on a muggy summer night. Their socio-political lyrics are reminiscent of The Cranberries and Sinead O’Connor, and the song “Acid Wash” â€” “This world, runs on acid, coal, trash, and gasolineâ€¦” â€” should be in a future Cohen brothers film. Mark my words. Gravely, Blouin’s vocal range doesn’t take you as far as her lyrics throughout Two Tired Hearts, which is why Ratliff’s electric solos keep this band chugging gracefully along. The Domestic Crisis Group – The Breaks from MichÃ¨le Gauthier on Vimeo.